John Joseph Ricketts (born July 16, 1941) is an American businessman and philanthropist. He is the founder, former CEO and former chairman of TD Ameritrade. He has a net worth of US$2.1 billion as of 2017 according to Forbes. He has pursued a variety of other entrepreneurial ventures including DNAinfo.com, High Plains Bison, The Lodge at Jackson Fork, and The American Film Company. Ricketts also engages in philanthropy through The Ricketts Art Foundation, Opportunity Education Foundation, The Cloisters on the Platte Foundation, and The Ricketts Conservation Foundation. John Joseph Ricketts was born and raised in Nebraska City, Nebraska, the son of Florence M. (Erhart) and Donavon Platte Ricketts. He obtained a bachelor's degree from Creighton University in Omaha, Nebraska in 1968. Ricketts is married to Marlene Margaret (Volkmer), with whom he has four children, Thomas, Pete, Laura, and Todd, who were raised Roman Catholic. He currently resides in Little Jackson Hole, Wyoming. In 2004, John Joseph Ricketts founded High Plains Bison, a retailer of natural bison meat. In addition to online and offline sales channels, High Plains Bison is the official bison vendor at Chicago's Wrigley Field. Some of the bison are raised on a Wyoming ranch owned by Ricketts. A four-bedroom lodge named The Lodge at Jackson Fork Ranch is located on the same property. 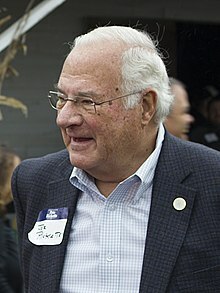 In 2009, Joe Ricketts founded DNAinfo.com, a digital news service that used to cover neighborhood news in New York City and Chicago. Ricketts shut it down on November 2, 2017, one week after their employees voted to unionize. Gone with it were Gothamist, Chicagoist, DCist, LAist, SFist, and Shanghaiist. On the 3rd of November, 2017, archived versions of Gothamist, DNAinfo, and other sites were back up. In September 2017, Ricketts wrote, "I believe unions promote a corrosive us-against-them dynamic that destroys the esprit de corps businesses need to succeed." In October 2009, the Ricketts family acquired a 95 percent controlling interest in Major League Baseball's Chicago Cubs and Wrigley Field, as well as 20% of Comcast Sportsnet Chicago. The Ricketts family represents the eighth ownership group in the 133-year history of the team. While Ricketts is not directly involved in the team's operations, his son, Tom Ricketts, is Cubs chairman and his three other children (Pete, Laura and Todd) are on the board of directors. In November 2010, the Cubs announced a plan to seek $200 million in state-backed bonds for renovations to Wrigley Field. The Cubs won the 2016 World Series. Ricketts co-founded the Campaign for Primary Accountability (CPA) with Eric O'Keefe, Leo Linbeck III, and Tim Dunn. It targets both Democratic and Republican incumbents in primary elections. In 2010, Ricketts led a campaign against earmarks and what he perceived to be wasteful federal spending. Ricketts founded an independent organization called Taxpayers Against Earmarks that classified every Member of Congress as either a spending "hero" or "hooligan." Along with Taxpayers for Common Sense and WashingtonWatch.com, Taxpayers Against Earmarks developed a database of earmarks requested by members of Congress. The group successfully pressed for a moratorium on earmarks in 2010. Taxpayers Against Earmarks changed its name to Ending Spending in 2011, as part of a broadening of the group's focus. Ricketts established and funded The Ending Spending Fund, a political action committee, in 2010. The Ending Spending Fund spent over $1 million sponsoring independent advertisements in several Congressional races. The goal of the advertising expenditure was to highlight incumbents' earmark-related policies. The Ending Spending Fund spent the largest amount of its money on the United States Senate election in Nevada, 2010 in an unsuccessful effort to defeat Senate Majority Leader Harry Reid. Although not required by law, Ricketts willingly disclosed his identity due to his belief in transparency. In the 2016 presidential election, Ricketts donated at least one million dollars in support of Donald Trump. Ricketts also raised funds for the Future45 Super Pac and the 45Committee, a pro-Trump 501(c)4 organization that is not required to disclose its donors. During the Republican primaries, Ricketts had contributed to Our Principles PAC, a Super PAC dedicated to opposing Trump. Ricketts explained his changed position citing economic grounds, stating that Hillary Clinton "represents four more years of the Obama-Clinton economic policies that continue to cripple the middle class." John Joseph Ricketts established the Opportunity Education Foundation, which underwrites the costs of training teachers and students in the Third World. The foundation supports an educational initiative through Louisiana College, a private Baptist college in Pineville, Louisiana, which trains teachers in East and West Africa. On September 26, 2013, Louisiana College president Joe W. Aguillard presented Ricketts and his brother, Jim, with two of three Trustees' Distinguished Service Awards at the annual Founder's Day chapel. "The little help that we give is really absorbed and used a great deal ... Let me thank you, Louisiana College, for having such an impact on the educational system in the Third World," said Joe Ricketts. Jim Ricketts, the president and CEO of the foundation and the former vice-president of TD Ameritrade, said, "We're serving the poor in ways that have never been done before ..."
On 5 February, 2019, Splinter News released a cache of Ricketts emails from 2009 to 2014. He described Islam as a cult and not as a religion. He wrote that Islam could not create a civil society and that “we cannot ever let Islam become a large part of our society." He wrote that “Muslims are naturally my (our) enemy.” Included were Obama citizenship conspiracy theory emails, and claims that Obama favored Islam over other religions. He quickly apologized for the emails. ^ a b c "J. Joe Ricketts". Forbes. 2017. ^ a b Smith, Bryan (June 24, 2013). "The Ricketts Family Owns the Chicago Cubs: Who Are These People?". Chicago Magazine. ^ LLC, Marquis Who's Who (1 July 1985). "Who's Who in Finance and Industry, 1985-1986". Marquis Who's Who, Inc. – via Google Books. ^ "Yahoo Finance: AMTD". Yahoo Finance. ^ Pompeo, Joe (July 31, 2012). "Inside billionaire Joe Ricketts' dreams of media empire". Retrieved 2012-07-31. ^ a b Lach, Eric (May 18, 2012). "Who Is Joe Ricketts?". Talking Points Memo. Retrieved 2012-05-18. ^ Nohr, Emily; Hammel, Paul (January 12, 2015). "Joe Ricketts envisions Sarpy County religious retreat open to all". Omaha World-Herald. Retrieved 2015-01-12. ^ "Ricketts Art Foundation, Buffalo Bill Center of the West, and the Museum of Mountain Man Launch Online Catalogue of Alfred Jacob Miller's Western Paintings". PR Newswire. 2015-11-12. Retrieved 2015-11-12. ^ Koshmr, Mike (2013-10-04). "Rancher-philanthropist steps in to study loons". Retrieved 2013-10-04. ^ Sullivan, Sean (2014-04-10). "Meet the super PAC both Republicans and Democrats should fear". Retrieved 2014-04-10. ^ "Obituary: Florence M. (Erhart) Ricketts, 95, of Omaha". ^ "Lesbian makes history as Cubs owner". Windy City Times. 2009-11-01. ^ Doebele, Justin (July 5, 1999). "The Next Charles Schwab?". Forbes. ^ McCrank, John (September 16, 2016). "UPDATE 2-Ricketts retires from TD Ameritrade board". Reuters. ^ Vettel, Phil (May 6, 2010). "Wrigley has 'em buffaloed". Chicago Tribune. ^ "Lodge at Jackson Fork Ranch - Greater Yellowstone Geotourism Mapguide". ^ Dyk, Deirdre Van (June 15, 2009). "Cowboy Up! Rugged Western Trips for Office Drones". Time. ^ Malanowski, Jamie (April 8, 2011). "TD Ameritrade's Founder Produces Historical Film". The New York Times. ^ Kaufman, Anthony (September 12, 2010). "Toronto Film Festival: Robert Redford on 'The Conspirator'". Wall Street Journal. ^ Cieply, Michael (September 15, 2010). "Redford's Film Is Picked Up in Toronto". ArtsBeat. ^ Flamm, Matthew (December 5, 2010). "Billionaire puts wager on really local online news". Crain's New York Business. ^ Gillette, Felix (May 19, 2010). "Three Birds, a Billionaire and the Hyper-Local Future of News". Observer. ^ Newman, Andy; Leland, John (November 2, 2017). "DNAinfo and Gothamist Are Shutting Down". New York Times. ^ Yanofsky, David (November 3, 2017). "DNAInfo's and Gothamist's archives still exist and are likely to be resurrected". Quartz. ^ "Why I'm Against Unions At Businesses I Create | Joe Ricketts". blog.joericketts.com. Retrieved 2017-11-09. ^ "Ricketts Family Assumes Control of Chicago Cubs". cubs.mlb.com. Chicago Cubs. October 30, 2009. ^ "Ricketts: No Plan B if state won't back Wrigley bonds". Chicago Breaking Business. November 15, 2010. ^ "Where Irish American Eric O'Keefe treads, incumbent politicians tremble". irishcentral.com. Irish Central LLC. April 12, 2012. Retrieved July 10, 2015. ^ Manu Raju, Study: 39,294 earmarks sought, Politico (December 6, 2010). ^ Jennifer Reingold, Joe Ricketts: The new billionaire political activist, Fortune (September 21, 2012). ^ Rachel Finkel, Ending Spending Action Fund, FactCheck.org (April 1, 2014). ^ Gibson, Jake, "New TV ad by 'The Ending Spending Fund' Targets Reid over Earmarks", Foxnews.com, October 28, 2010. ^ Terkel, Amanda (2010-10-22). "The One-Person Funded Super PAC: How Wealthy Donors Can Skirt Campaign Finance Restrictions". Huffington Post. ^ Saletan, William (17 May 2012). "The Wrath of Cons, A proposed super-PAC assault on Obama exposes the right's rage". Slate. ^ Blake, Aaron, and Sandhya Somashekhar, "Joe Ricketts, a wealthy donor, getting attention in presidential contest", Washington Post, May 17, 2012. Retrieved 2012-05-18. ^ Sullivan, Sean (10 April 2014). "Meet the super PAC both Republicans and Democrats should fear". Washington Post. Retrieved 10 April 2014. ^ a b Mak, Tim (2012-05-18). "Ricketts' aide: Jeremiah Wright plan was DOA". Politico. Retrieved 2012-05-18. ^ Zeleny, Jeff; Jim Rutenberg (2012-05-17). "G.O.P. 'Super PAC' Weighs Hard-Line Attack on Obama". New York Times. Retrieved 2012-05-18. ^ Burns, Alexander (2012-05-17). "Ricketts flack says Wright attack plan has been rejected". Politico. Retrieved 2012-05-17. ^ Overby, Peter (September 1, 2014). "A Political Family, Funding And Running On Both Sides Of The Aisle". NPR. Retrieved September 3, 2014. ^ a b Gold, Matea (20 September 2016). "After opposing Trump in the primaries, Joe Ricketts will give at least $1 million to support him". Washington Post. Retrieved 10 October 2016. ^ Vogel, Kenneth (28 September 2016). "Secret money to boost Trump". Politico. Retrieved 10 October 2016. ^ a b c "Lee Guidry, Louisiana College honors 3 for distinguished service, September 26, 2013". Alexandria Daily Town Talk. Archived from the original on September 27, 2013. Retrieved September 27, 2013. ^ Miller, Joshua Rhett (2019-02-05). "Cubs patriarch Joe Ricketts has troubling emails revealed: 'Islam is a cult'". New York Post. Retrieved 2019-02-06. ^ Draper, Kevin (2019-02-05). "Cubs Owners Reel After Emails of Family Patriarch Come Out". The New York Times. ISSN 0362-4331. Retrieved 2019-02-06. ^ "Cubs patriarch Joe Ricketts apologizes for leaked emails that said 'Muslims are naturally my enemy'". sports.yahoo.com. Retrieved 2019-02-06. This page was last edited on 10 March 2019, at 14:04 (UTC).